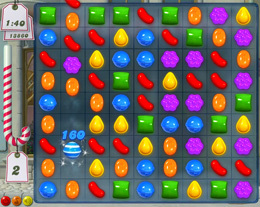 Of all the silly reasons not to come up with a blog post today, reaching level 50 on Candy Crush is one of the silliest. I downloaded it Friday, played to level 35, then had to wait 48 hours for the two mandatory holds to clear. Having your latest obsession go live at 7:30 am Monday morning is not a formula for productivity. Horses were fed. Dishes were done. Work calls where made. I even called about a horse for sale. Staggering progress was not achieved. Save yourself. Do Not Download. You have been warned. The game is free. Playing is free. However, if you would like more lives, move faster, get helper icons, you can pay anywhere from $0.99 to $40. I can’t figure out if the marketing plan is diabolical or brilliant. I’m playing it on facebook. It has not helped revision at all. I’m on level 65, have been for about 5 days now. And when I pass a level I feel achievement greater than having done well on my assignment. I’m not obsessed, I could stop whenever I want..